Flying squirrels are a species, not a job description -- at least according to Frontier Airlines. The Orlando Police Department was forced to remove a woman from a Frontier Airlines plane Tuesday night after she tried to bring a squirrel on board, claiming it was an emotional support animal, according to the airline. The woman was advised that squirrels are not allowed on board by Frontier's support animal policy. "The passenger noted in their reservation that they were bringing an emotional support animal but it was not incidated [sic] that it was a squirrel," the airline said in a statement provided to Orlando ABC affiliate WFTV. "Rodents, including squirrels, are not allowed on Frontier flights." According to its website, Frontier's policy reads: "We do not accept unusual or exotic animals including but not limited to rodents, reptiles, insects, hedgehogs, rabbits, sugar gliders, non-household birds or improperly cleaned and/or animals with foul odor." But not only was the woman removed, everyone on the flight had to deplane after she refused to exit. "When she refused to deplane Orlando Police were called and requested that everyone be deplaned so they could deal with the passenger," Frontier said in its statement. "Police eventually escorted the passenger off the aircraft and took her to the main terminal." Video shot by passengers on the plane showed the woman being taken off the plane in a wheelchair as she was jeered for refusing to comply with the airline's orders. She flashed a middle finger and then thumbs up as people clapped for her removal. 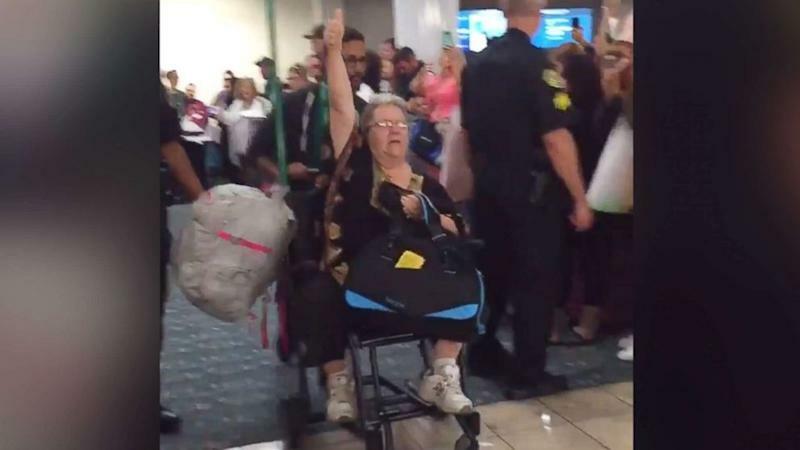 The flight later departed Orlando for its destination in Cleveland -- without the woman -- after a two-hour delay. Airlines cracked down on what animals could be brought on board flights for emotional support after photos and videos of a number of unique animals went viral earlier this year. In January, a woman tried to bring a peacock on board a flight in Newark, New Jersey, which prompted United to update its guidelines for emotional support animals. Several other airlines updated their policies this year as well, including JetBlue and Delta, which banned pit bulls in a controversial move. Frontier Airlines is actually changing its policy for support animals beginning Nov. 1. The airline will only accept cats or dogs, each passenger is only allowed one animal and advanced notice must be provided 48 hours before departure. ABC News' Cammeron Parrish contributed to this report.